Puri Bagus Manggis is located directly in the center of the traditional village of Manggis, the easternmost district of Karangasem. The pace in this private, peaceful center is slow and relaxing. 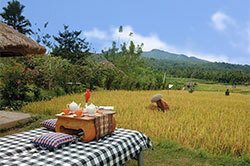 Views of the surrounding rice fields assists with opening up your senses and allowing an appreciation of life in its fullest. 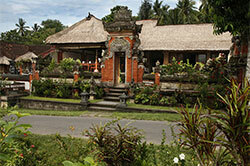 Majestic Mount Agung provides a backdrop to this village. The staff are gracious and welcoming and will assist with any of their guests needs. 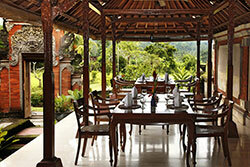 The food is prepared with love – offering traditional Baliinese cuisine as well as International fare. The center is built in traditional architectural style. Originally a family compound, the resort has been transformed into 7 exquisite guest rooms with a swimming pool and an outdoor dining area.